Our Easter Plant Parade on 26 March awoke to threats of blustery winds and rain — Storm Katie was heading out way! 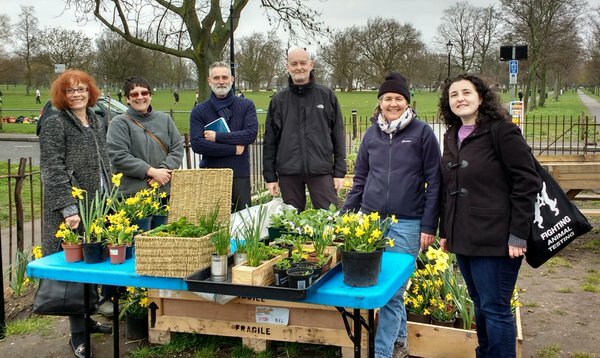 But undeterred, we set up our plant stall bringing our own brand of sunshine: daffodils and violas together with broad beans and bags of salad leaves harvested from the polytunnel. Jo and Dee were at the ready with the paints to decorate children’s faces but the cold weather meant there weren’t many takers. The Common was much less busy than usual showing how just many folk had gone away for Easter, and those left behind just weren’t braving the gusty winds. 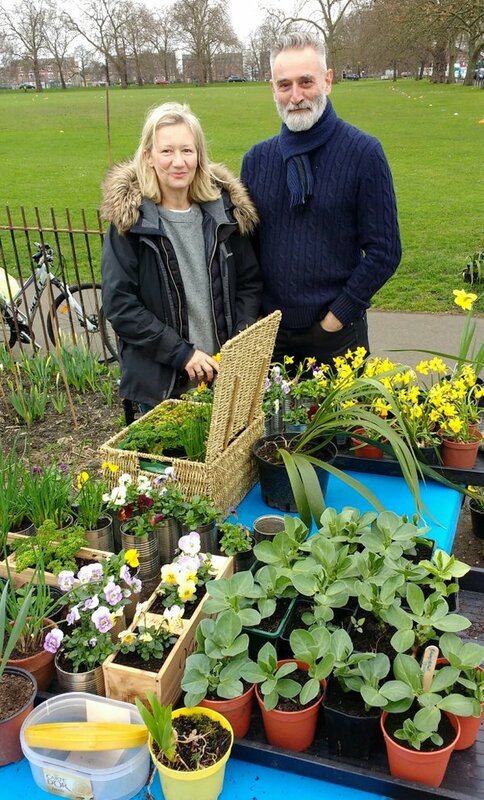 But we did have a visit from Todmorden’s community food-growing activist Pam Warhurst, looking to develop the Clapham Edible Route – and Bandstand Beds community growing space is a key point on the route! Local councillor Nigel Hasleden joined in the discussion and we all enjoyed mugs of warming home-made soup, thanks to Jane and Diana, served up with wonderful sourdough bread from The Old Post Office Bakery on Landor Road. 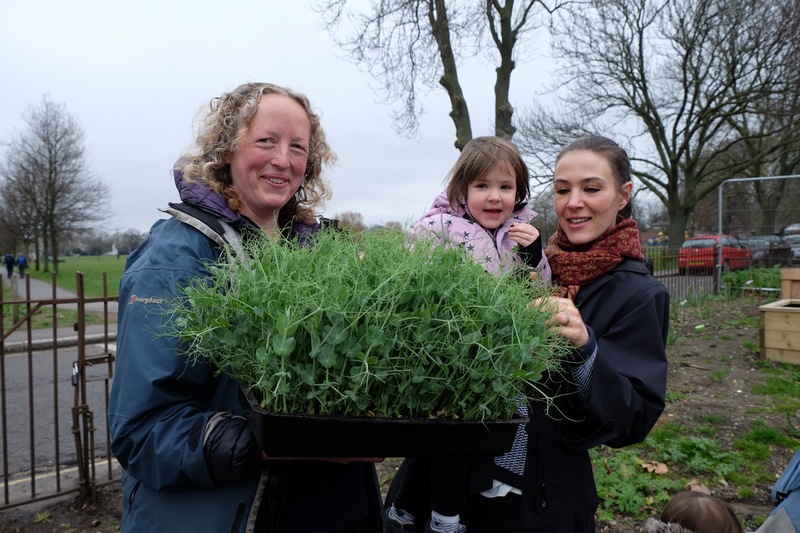 Join us again on Saturday16 April from 10am to 1pm when we’ll be taking part in Capital Growth’s The Big Dig. Community Gardener Emily Myers will be leading the session at the garden on Windmill Drive, sowing seeds for this summer’s crops. We’ll also be sprucing up the beds beside La Baita and checking on the potatoes planted at the Spinney Beds earlier in the year. On Saturday 30 April from midday to 6pm there will be a Common People event on the Bandstand. 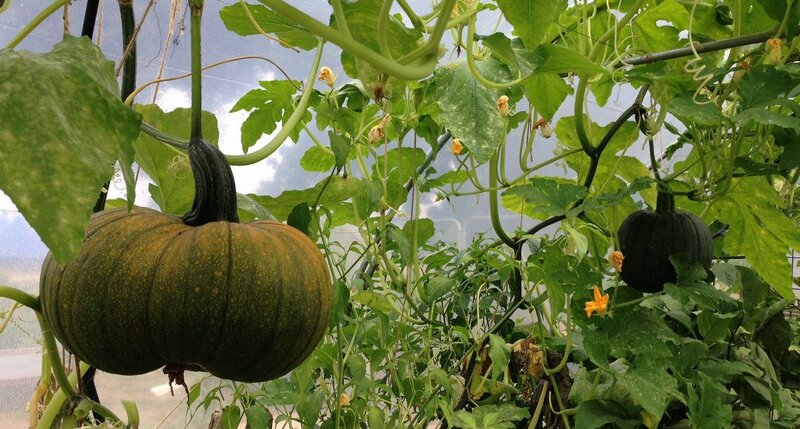 There’ll be bands, singers, dance and an open mic spot, plus food growing activities, Dr Bike cycle maintenance and much more… And it’s free and open to everyone!